Today marks International Youth Day – a day that celebrates youth and invites actors to address youth issues worldwide. This year’s theme aims to promote youth engagement and empowerment by exploring the meaning of safe spaces. What exactly constitutes a safe space is often unclear, perhaps because a safe space means different things to different people. A safe space is not something that can be established objectively: the feeling of safety will always be subjectively experienced by individuals. The same spaces that are considered safe by one could easily be deemed unsafe by another. Though we most commonly associate it within the context of Western university campuses, a safe space generally refers to a space in which anyone can feel confident that they will not be exposed to discrimination, criticism, harassment, or any other emotional or physical harm. This gives one the ability to openly express individuality, ensures one’s dignity, and provides one with opportunities to gather and participate in leisure activities or to talk and engage in meaningful dialogues. Bearing this in mind, it is no surprise that the creation of a safe space is vital within the practice of youth-led peacebuilding intended to address communities divided by conflict. Community members need a space where they feel comfortable in order to meaningfully participate in any peace-building programmes addressing existing divides. In such a case, a safe space facilitates exchanges between diverse youth that might not have interacted otherwise. The creation of safe spaces has been an essential part of the development of Generations For Peace peace-building programmes. One of the innovative tools that GFP uses to this end is sport, which is considered a universal language that facilitates transformative interaction when carefully planned and managed. 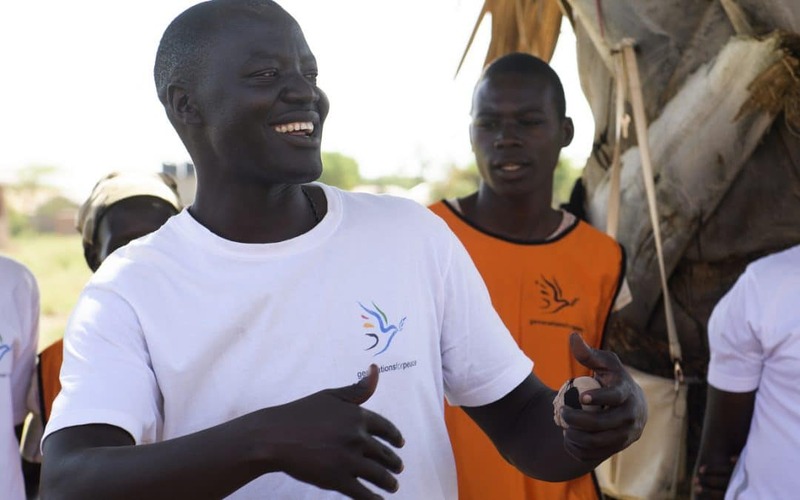 Yet safe spaces remain difficult to conceptualise; however, there are five primary dimensions that shape a safe space, as explained by Ramon Spaaij and Nico Schulenkorf, and each are highlighted throughout GFP Sports For Peace Programmes. So, what are these dimensions, and how exactly do the Sport For Peace activities implemented by GFP create safe spaces? The physical dimension is likely the most obvious: a safe space should be accessible to all and should provide safety from physical harm. Furthermore, the space needs adequate facilities to accommodate the needs of its visitors. As GFP tries to make use of already existing structures in which to conduct its programmes, finding a facility that meets the physical dimension sometimes calls for creativity. In South Sudan, the state of the basketball courts was not ideal, and challenges of transportation and infrastructure had to be overcome. Physical safety, alone, will not create a safe space. The psychological dimension is essential, as it protects participants from psychological or emotional harm, and is “typically concerned with the establishment of trust, a sense of engagement, and a common identity within the confines of the activity.” The creation of this dimension through the Sports For Peace activities is wonderfully illustrated through the story of David. After taking part in the programme in Georgia, his sense of engagement with his community grew, and the trust that was built led him to be able to socialise with youth from different backgrounds than his, leading to increased academic and career success. The third dimension ties into the second very closely, but is slightly more abstract. The sociocultural dimension has the goal of creating familiarity, where all participants within the safe space feel comfortable and familiar with one another in order to share a meaningful interaction, regardless of their backgrounds. For the Sport For Peace activities in the Republic of Macedonia, this means bringing together Macedonians and Albanians, who are typically divided along ethnic lines further enforced by a difference in language. GFP’s sessions created a feeling of safety and stimulated openness despite the ethnic mixture of the students, ensuring that they felt part of the activities, all experiencing a sense of belonging. The experimental dimension highlights the fact that the space should be safe, but not free of all conflict – just free of the violence that too often results from it. Non-violent conflict induces creativity, critical thinking, and innovation, each of which Generations For Peace uses to build peace. For a safe space to be transformative in any way, conflict should be carefully navigated by educators, facilitators, and volunteers. There is, however, a sixth dimension that Generations For Peace finds to be perhaps most vital. Youth-led peace-building efforts are meant to have a long-lasting impact, which is why GFP’s safe spaces are specifically designed to be passed on: by using a cascading model, facilitators, participants, and volunteers are expected to transfer what they have experienced within the existing five dimensions of safe spaces to others, creating a further reaching safe space than before. By encouraging participants of, for example, the Sports For Peace programmes to pass on their newly found mindset of unity, inclusiveness, and acceptance, the community remains engaged. Within this new dimension, a safe space becomes something sustained – something perpetual. In short, the safe space becomes mobile.